Thank you to all the artists who said yes to TYPO. Thank you Martin Albarran of La Productora for hosting and co-organizing. Thank you to all our friends for supporting us. Thank you to the audience that attended and enjoyed the work. Thank you to all that bought art and catalogs. Last but not least, thank you iamsatos team Pedro, Jonathan and Rebecca for the hard work. Until next time we meet, M.
November 15, 2013 by Mariana Ortiz-Reyes. 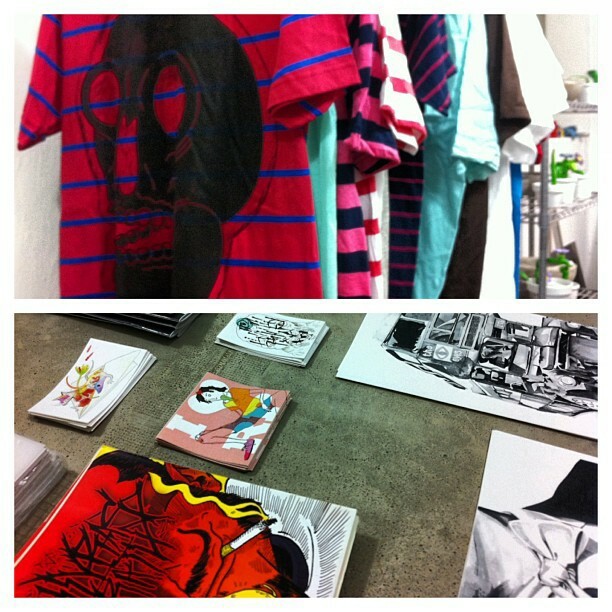 Tagged with ART, PUERTO RICO, TYPO, LA PRODUCTORA, EXHIBIT. September 12, 2013 by Mariana Ortiz-Reyes. San Juan, August 6, 2013 - La Productora & i am satos™ invite the general public to participate in the collaborative TYPO, an event that brings together collectives who work in the creative industries. The event features an exhibition, and includes activities such as demonstrations, talk with the artists and creators, screening of short films and videos, and the launch of the first print edition of i am satos™ Journal. The event will be held on August 31, 2013 starting at 2pm in La Productora, space located at 619 Cerra Street, Santurce, Puerto Rico. The motivation for the event is to explore the creative development of different disciplines, as well as highlight the role of collaboration in these creative processes. For it we have convened creative collectives to show their work as the audience is encouraged to interact with them. The exhibition will feature the variety of forms that the meaning of collaboration takes in creative production. The event will also be an opportunity for discovering and creating new networks with individuals and projects that are out of our reach and that of the participants. TYPO will have the participation of collectives: Buena Vibra, Cinestesia, Colectivo Fibra, Colectivo Marvelous, elCoCa, Hello Again, Laboratorio del Error Diseñado, Pernicious Press, PISO Proyecto, RescatArte, Retrospective Pictures, Tost Films, WAI Think Tank and Wallpeople San Juan. Who are we? i am satos™ proposes a platform where young Puerto Ricans practitioners of the creative industries can share their work and personal experiences while in their particular cultural and social contexts. The purpose of i am satos™ is expose the creative culture of Puerto Rico, both locally and internationally, to promote awareness and add to its value. Since the launch of the first phase of this project in March 2013, i am satos™ Journal exists as a digital magazine in the web at iamsatos.com. 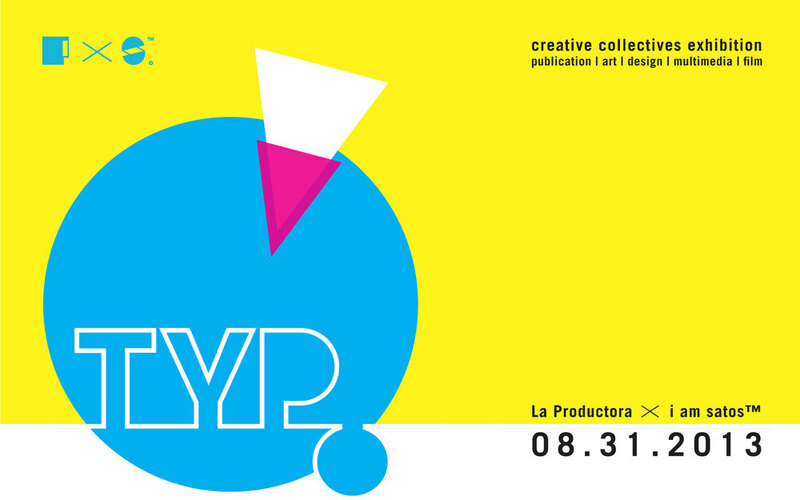 It has been key to join forces with La Productora for the ideation and development of TYPO. La Productora is an alternative space where art and design converge. This space, located at 619 Cerra Street in Santurce, is at the same time studio and creative workshop that sporadically transforms into a gallery for local and international artists and designers. San Juan, 6 de agosto de 2013 - La Productora y i am satos™ les invitan a participar del colaborativo TYPO, un evento que reúne colectivos que se desempeñan en las industrias creativas. El evento protagoniza una exhibición de trabajo, e incluye actividades como demostraciones, conversatorio con los creadores y el público, proyección de cortometrajes y videos, y el lanzamiento de la primera edición impresa de la revista i am satos™ Journal. El evento ocurrirá el sábado 31 de agosto de 2013 comenzando a las 2pm en La Productora, espacio ubicado en la calle Cerra 619 Santurce, Puerto Rico. La motivación para el evento es explorar el desarrollo creativo de distintas disciplinas, así como destacar el rol de la colaboración en estos procesos. Para ello se ha convocado a colectivos creativos para exponer su trabajo y estimular la interacción con el público. La exhibición destacará la variedad de formas que el significado de colaboración toma en la producción creativa. El evento también será la oportunidad para descubrir y crear vínculos con individuos y proyectos fuera de nuestro alcance usual y aquel de los participantes. TYPO cuenta con la participación de los colectivos: Buena Vibra, Cinestesia, Colectivo Fibra, Colectivo Marvelous, elCoCa, Hello Again, Laboratorio del Error Diseñado, Pernicious Press, PISO Proyecto, RescatArte, Retrospective Pictures, Tost Films, WAI Think Tank y Wallpeople San Juan. ¿Quiénes somos? i am satos™ propone una plataforma donde puertorriqueños jóvenes practicantes de las industrias creativas pueden compartir su trabajo y experiencias personales en sus contextos culturales y sociales particulares. El propósito de i am satos™ es exponer la cultura creativa de Puerto Rico, en y fuera de la Isla, para promover conocimiento y añadir a su valor. Desde el lanzamiento de la primera etapa del proyecto en marzo de 2013, i am satos™ Journal existe como revista digital a través del portal web iamsatos.com. Ha sido clave unir esfuerzos con La Productora para la elaboración del colaborativo TYPO. La Productora es un espacio alternativo donde convergen arte y diseño. El espacio, ubicado en Calle Cerra 619 en Santurce, es a la vez estudio y taller creativo que se transforma en ocasiones como galería para artistas y diseñadores locales e internacionales. Tagged with TYPO, PUERTO RICO, ART, DESIGN, FILM, MULTIMEDIA, PUBLICATION, LA PRODUCTORA. August 6, 2013 by Mariana Ortiz-Reyes. La Productora & i am satos™ invite you to participate in the collaborativele TYPO, an event that brings together collectives that work within the creative industries. The event features an exhibition, and includes various activities such as demonstrations, talk with the artists, screening of short films and videos, and the release of the first print edition of i am satos™ Journal. The event will take place Saturday August 31, 2013 at La Productora from 2pm until 10pm. More details and complete itinerary coming soon. Tagged with TYPO, ART, DESIGN, FILM, MULTIMEDIA, PUBLICATION, ARTISTS, LA PRODUCTORA, PUERTO RICO. August 5, 2013 by Mariana Ortiz-Reyes.